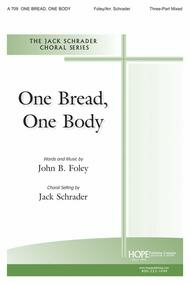 One Bread, One Body composed by John B. Foley. Arranged by Jack Schrader. For 3-part mixed choir (2-part). Sacred, Communion, Unity, General. Octavo. Published by Hope Publishing Company (HP.A709).The 3-part setting by Jack Schrader of the very popular John Foley communion song, "One Bread, One Body," starts as a slow ballad and builds throughout. Often sung by the congregation, this anthem provides opportunity for the choir to present its grand statement of church unity.